Al Raha Beach Hotel, the first five star deluxe boutique hotel in Abu Dhabi, is a heaven of elegance and comfort, a resort offering the ultimate in service, sophistication and superior beach - front setting. 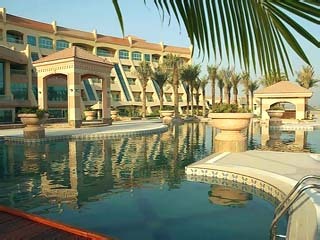 The Hotel is ideally positioned in landscaped gardens on the Al Raha corniche facing the Arabian Gulf. It is 20 minutes away from the city center of Abu Dhabi and close to the airport. The most spacious and elegantly appointed rooms in the United Arab Emrates can be found at the Al Raha Beach Hotel. With 24 villas, 110 deluxe rooms and suites, including junior, executive, diplomatic and royal suites, the hotel provides a unique Abu Dhabi accommodations option. All accommodations are tastefully and comfortably furnished and offer superb amenities, includinghigh-speed Internet access, work desk, separate seating area, balcony, flat-screen television with satellite channels, premium bedding, safe, complimentary bottled water, bathrobes, and slippers that ensure guests both a relaxed and memorable stay. The two, three, and four bedroom villas provide a perfect alternative for those seeking five-star hotel services. The villas and their surrounding areas provide seclusion and privacy with their own club house, outdoor swimming pool, and beach. With marbled corridors, distinctive woodwork and furniture, private living rooms, dining rooms and kitchens, the villas provide for an unrivalled experience of home away from home. Available with a twin-size bed at 65 square meters, these gracefully designed rooms beckon the lush views of the garden. With dedicated bedside reading lights and a bedside panel that controls all electronic facilities of the room, the rooms offer advanced simplicity and generous comfort. All rooms are equipped with high-speed Internet access and all premium comfort amenities and facilities guests expect. These bright and airy 55 square meter rooms have floor-to-ceiling windows and are perfect for a quiet respite. Soak up the style of this Arabian designed room with a choice of twin-size or king-size bed with plasma-screen television. Relax in the marble bath while enjoying the breathtaking view of the Arabian Gulf or have afternoon tea on the spacious balcony. All rooms are 55 square meters and offer a panoramic view over the swimming pools and the beach. Available with a double or twin-size bed, each room has a balcony and windows over the entire width of the room, as well as high-speed Internet access. Indulge in the extra space of this tastefully designed 55 square meter suite. The cheerful and bright room has a relaxing view overlooking the eclectic manicured garden. Get to work at the desk and check emails with high-speed Internet access. Be pampered in the marble bath featuring separate tub and walk-in shower, large mirror, and make-up mirror. Designed with the discerning business traveler in mind, this 100 square meter suite makes work away from home easy. In this modern yet refined suite, guests can enjoy an exclusive layout with separate bedroom and living room complete with high-speed Internet access and plasma-screen television. Refresh in the marble bath with a view of the Arabian Gulf and an impressive list of amenities. The balcony is a great spot to sit back and relax after a long day out. Be spoiled in this meticulously designed 200 square meter suite with a magical touch of the culture between Arabian and modern design. This amply-sized suite gives the feeling of a private apartment overlooking the lush garden and includes a separate living room, working, and dining areas. Curl up on the sofa and enjoy the DVD player and home theater system, or relax in the spacious marble bath with exclusive high-end amenities. Take in the breathtaking views of the Arabian Gulf from the floor-to-ceiling windows in these 400 square meter signature suites, superbly designed with a touch of elegant fusion, neo-classical, and contemporary looks. The suites have 2 spacious bedrooms with private baths, tastefully decorated Majlis, living room with guest toilet, separate kitchen with access door, and 1 maid single room with own bath. The balconies offer a spectacular view of the Arabian Gulf. The 500 square meter villa has two bedrooms with private baths overlooking the lush garden, a spacious living room, complete kitchen and dining room, individual garage, beautifully private manicured garden and most of all, privacy and tranquility of being away from it all. Lounge on the specially dedicated pool and beach just a few minutes walk from the villa. Refreshingly inviting, the immaculately appointed 715 square meter three bedroom villa exudes comfort and luxury with a subtle touch of elegance. Inspired by the finer elements of the Arabian culture, the villa is exclusively designed for families in mind. The villa is built with a fully equipped kitchen, dining room, spacious living room, private garden and terrace, individual garage, and a host of comforts not found at home. Refresh mind and body at the dedicated pool for the villa residences with the white, sandy beach just a walk away. Retreat to the elegantly appointed 715 square meter villa that boasts a view of the majestic Arabian Gulf, ideal for executives with a medium to long-term stay. Embellished with instinctive touches, the villas come with a well-equipped kitchen, tastefully decorated Majlis with ample daylight to relax, separate study nook, and four master bedrooms. Its interiors are combined with international and local touches with the emphasis on soft furnishings in warm colors. This four bedroom villa has its own dedicated private garage and garden for an unrivalled experience of a home away from home. Al Raha Beach Hotel serves a complimentary breakfast each morning. Six restaurants, two bars, and a nightclub are onsite. The hotel features a private beach, an indoor pool, outdoor pool, a children's pool, spa tub, fitness centre, sauna, steam room, an onsite spa, and a hair salon. A marina is on site. Concierge services, multilingual staff, and laundry facilities are available. Sample a feast for the senses at　the hotel's　ensemble of Abu Dhabi restaurants and bars. A culinary team consisting of 20 nationalities in 6 kitchens ensures an exciting dining experience no matter which restaurant guests choose to dine in. Only the freshest regional and imported ingredients are used in these service-oriented dining venues. This all-day dining restaurant offers creatively prepared dishes with European, Italian and Asian influences. The restaurant brings inspiring and innovative world cuisines from a spectacular elevated location overlooking the Arabian Sea. The ultra stylish 100-seat restaurant is an open kitchen concept that is dominated by a central skylight, creating a distinctive day and night mood coupled with live, soothing entertainment. Its contemporary crescent shape design and stylish features makes it an exotic and elegant venue for breakfast, lunch or dinner, with an outdoor terrace dining option adjoined to a wine cellar. Buffet breakfast served from 7 to 11:00 a.m.
Buffet lunch served from 12:30 p.m. to 4:00 p.m.
Buffet dinner served from 7:00 p.m. to 11:00 p.m.
All-day dining a la carte menu available from 12:30 p.m. to 11:00 p.m.
A stylish all day dining café perfect for a quick and tasty snack at anytime of day. The Café Mozart maintains Al Raha Beach Hotel’s tradition of elegance with daily traditional English and Colonial Afternoon Tea with live harp music. High Tea is served daily and features a selection of delicate pastries, warm scones with jam, finger sandwiches, and exquisite fine teas. The café is open 24-hours and also serves signature mocktails and Cuban cigars. This spacious poolside restaurant offers a blend of Continental, Arabic and Far East flavors using only the finest and freshest ingredients. Set amidst lush tropical greenery, the restaurant is complemented by sandstone floors, creating an intimate ambiance perfect for a day of relaxation. The restaurant offers a wide selection of summer cocktails, appetizers, sandwiches, and salads that　sunbathers and swimmers can enjoy. Azur is an exquisite restaurant offering a unique blend of culinary art and the finest Mediterranean cuisine. Choose to dine alfresco under the stars with a breathtaking view over the manicured garden and pool, or within Azur’s relaxed and intimate atmosphere with live entertainment. Open daily from 12:30 p.m. to 11:00 p.m. Enjoy a tropical drink or relax with a glass of champagne at Al Manzil Terrace, a perfect place for a romantic dinner for two. The restaurant has 30 seats indoors and 60 seats on the outdoor terrace　with breathtaking views of the Arabian Gulf. Open daily from 7:00 a.m. to 10:00 p.m.
A La Carte and Continental breakfast served from 8:00 a.m. to 10:00 p.m.
A La Carte lunch menu available from 12:30 to 3:00 p.m. Afternoon Tea, homemade pastries, and cocktails are served until 10:00 p.m.
An exclusive piano bar featuring 20 classic and contemporary martini selections plus a single malt whiskey collection, the Black Pearl is ideal for pre or post dinner relaxation. The translucent optic glass bar is the Black Pearl’s centerpiece, and the intimate bar boasts an indoor club atmosphere overlooking the pool areas and the stunning Arabian Sea. Cocktails and bar bites available from 6:00 p.m. to 2:00 a.m. The Enigma nightclub is a 5,000 square feet landmark nightclub and entertainment venue with its own separate entrance from the hotel. A two-level elegant, modern, and open dance floor houses UAE’s most popular and hottest DJ's. Enigma can host private parties ranging from 100 to 1,000 people. With a state-of-the-art lighting system, elevated DJ booth, large dance floor, four bars with professional bartenders, qualified security personnel, and exclusive VIP lounge, any event will be one to remember. Open Thursday and Friday from 10:00 p.m. to 3:30 a.m. Located on the 3rd-floor Spa, reflecting the elementary purpose of the Spa - good health, balance and overall well-being, and nourishment of the mind, body and soul - the Vita Bar is a haven before or after treatments. A choice of delicious and healthy fruit and vegetable juices and irresistible smoothies caters to the sweet tooth or the energy seeker. Revitalize your body at the Vita Bar after a workout, treatment or dance lesson. Open daily from 9:00 a.m. to 9:00 p.m.